M4P is DRM protected audio format from iTunes Store. M4P audio could be either music tracks you purchased in iTunes Store before March 2009, or Apple Music tracks you downloaded as long as you have a valid subscription of Apple Music. If you want to use iTunes M4P audio files freely, it’s recommended to convert M4P to MP3. TuneMobie Apple Music Converter is the best M4P to Mp3 Converter which can convert purchased M4P audio and downloaded Apple Music tracks. Part 1: What is an M4P File? Part 2: Why I need an M4P to MP3 Converter? 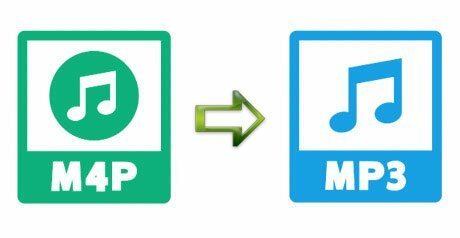 Part 4: How to Convert M4P to MP3 without Quality Loss? What is an M4P File? A file with M4P extension is a protected music track from iTunes Store. It’s similar to general AAC audio in M4A format. In fact, there are 2 types of M4P files, both of them are all DRM protected music tracks from iTunes Store, however, based on time points, they are actually quite different. Before March 2009, M4P files were music songs you purchased and downloaded from iTunes Store. Once you purchased a song from iTunes Store, you can download a music file in M4P format, it can be only played on authorized computers and Apple devices including iPod Touch, iPod Nano/Shuffle/Classic and iPhone. However, Apple allows you to burn your purchased M4P tracks to an Audio CD. Apple had completely stop selling DRM M4P songs in March 2009 and then started to sell DRM-free M4A songs instead. 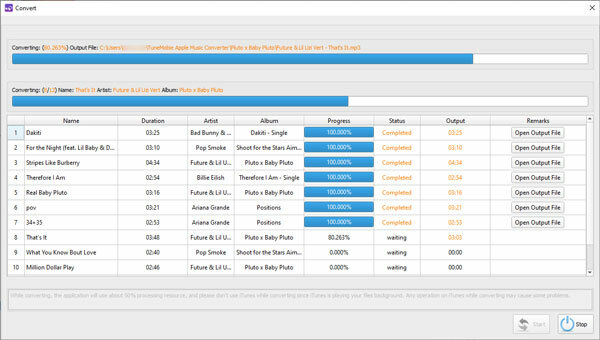 Most users had already upgraded their M4P songs to DRM-free M4A songs. On June 8, 2015, Apple announced Apple Music services and launched on June 25, 2015 in over 100 countries worldwide. Apple allows you to download the Apple Music tracks for offline listening. And the downloaded Apple Music songs are also in M4P format. Apple Music M4P songs can be played on Windows, Mac, iPhone, iPad, iPod Touch, Apple TV and Android phones, however, Apple won’t allow you to burn such M4P songs to CD or sync to iPod Shuffle/Nano/Classic for playback because you only subscribed the service but you are not the owner of the M4P songs. You will lose access to these M4P songs if you unsubscribe Apple Music and valid period expires. Why I need an M4P to MP3 Converter? The M4P format brings much inconvenience, you can’t listen to the tracks on any MP3 players, PSP, PS3, Xbox, Android TVs, Windows phone, Symbian devices, etc., you can use M4P track as background music for DVD authoring software or video editing software. 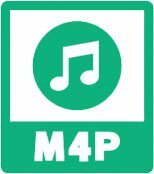 The old M4P songs can’t be played on Android devices and the new Apple Music M4P songs can’t be played even on some Apple devices like iPod Nano, iPod Shuffle, iPod Touch 4, etc. To solve all the problems stated, converting M4P to MP3 is a perfect solution. Most audio converters on the market can’t even recognize M4P file extension because of DRM protection, luckily, we have the best M4P to MP3 Converter named TuneMobie Apple Music Converter. TuneMobie Apple Music Converter is regarded as the best M4P to MP3 converter because it can convert both old iTunes M4P songs and new Apple Music M4P tracks. And the output MP3 files will preserve all ID3 tags like title, artist, album, track number, etc. 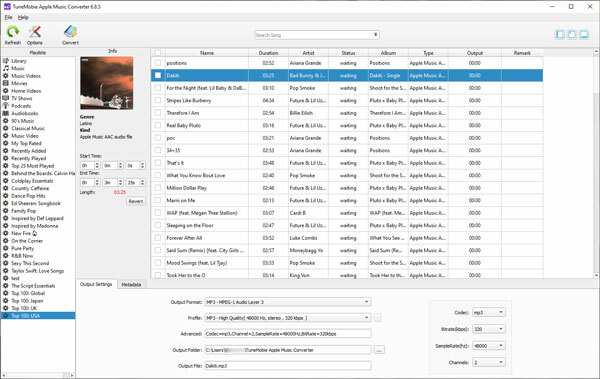 TuneMobie Apple Music Converter supports batch conversion and 16X faster conversion speed, so it’s very easy to convert a bunch of iTunes M4P files in a short time. Besides, you can rename and sort output MP3 files by using ID3 tags. Just specify the rules in the options and all the process will be done in conversion, there is no extra operation needed. This program is available on both Windows and Mac, just download and install the free trial version below. How to Convert M4P to MP3 without Quality Loss? Here we will show you how to use TuneMobie Apple Music Converter to convert M4P to MP3 without any quality loss in several simple and easy steps. Launch TuneMobie Apple Music Converter and it will launch iTunes automatically. All Apple Music M4P songs, albums and playlist, iTunes M4P tracks, purchased iTunes M4A songs and other iTunes supported audio formats will displayed as playlists in the left panel. Choose any M4P songs you want to convert by ticking the checkbox. 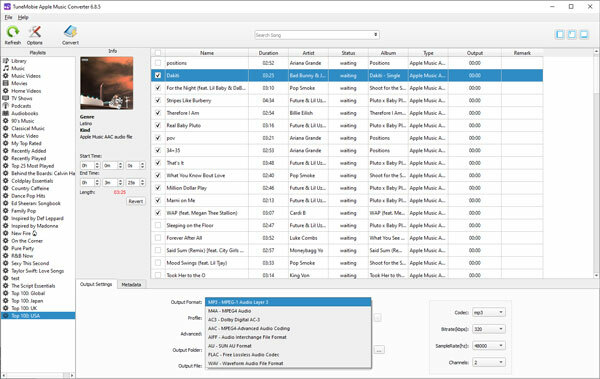 If you have got a huge library of M4P songs, you can use built-in search box to target the songs quickly by enter artist, album or song title. When clicking on a song, artwork will be also displayed. Actually, MP3 is the default output format of this M4P to MP3 converter. Both old M4P tracks and Apple Music M4P files are 256kbps AAC, if you want to convert M4P to MP3 without quality loss, click profile list and choose “MP3 - High Quality (48000Hz, Stereo, 320kbps)”, this will help you get lossless quality in output MP3 files. If necessary, you can click Options button to adjust conversion speed, set custom output file, etc. Now, simply click Convert button to start converting the selected M4P songs to MP3. After the conversion process, you can click “Open Output File” button and get MP3 files. Though Apple Music had stopped selling DRM M4P songs for quite a long ago, Apple still use M4P as file extension for offline Apple Music tracks. Remember that the MP3 songs converted from Apple Music M4P tracks are only for your personal use, never share them on internet. As to iTunes movies and TV shows, Apple has been using M4V file extension and M4V videos from iTunes Store are also DRM protected. If you want to enjoy iTunes movies and TV shows on Android phones and tablets, give M4V Converter Plus a shot.